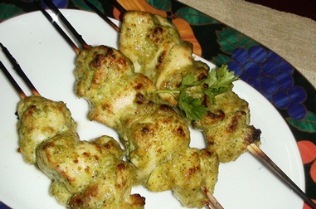 Wash the chicken cubes thoroughly & pat dry with a paper towel.Soak the bamboo skewers in water for at least 1 hour.Apply a mixture of one tablespoon lemon juice and salt over the chicken cubes and set aside for half an hour in a refrigerator.In a bowl combine rest of the marinade ingredients and mix well to remove any lumps. Rub this marinade on the chicken cubes .Transfer the chicken pieces and marinade in a bowl ,cover the bowl with a plastic wrap and marinate overnight for at least 1-2 hours in a refrigerator. This is what I do: Preheat the oven at 450 F broiler mode.Line a baking sheet with aluminum foil and arrange the chicken skewers on it.Brush the chicken pieces with ghee. Tip the sheet inside the oven on top rack and cook for about 22-25 minutes flipping it after 15 minutes till chicken is done on all sided but still tender.You may get some burnt marks on the chicken but that’s okay!Grill the chicken for 2o minutes or till done and but still tender.In between keep on brushing with the ghee and the marinade.Heat a large pan/skillet and coat it with ghee. Place the skewers with chicken piece on the pan and cook medium heat for about 15-20 minutes turning them around and brushing with ghee and the marinade.Cook them till the chicken pieces are tender and you see brown colored spots on the tikkas.